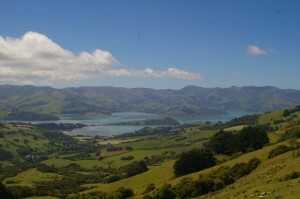 A view of Akaroa Harbor from the pass above. The bay and its towns are situated in the caldera of an extinct volcano. To get there we had to drive along the crater rim, which meant ordering up a slice of road with Extra Twisty. 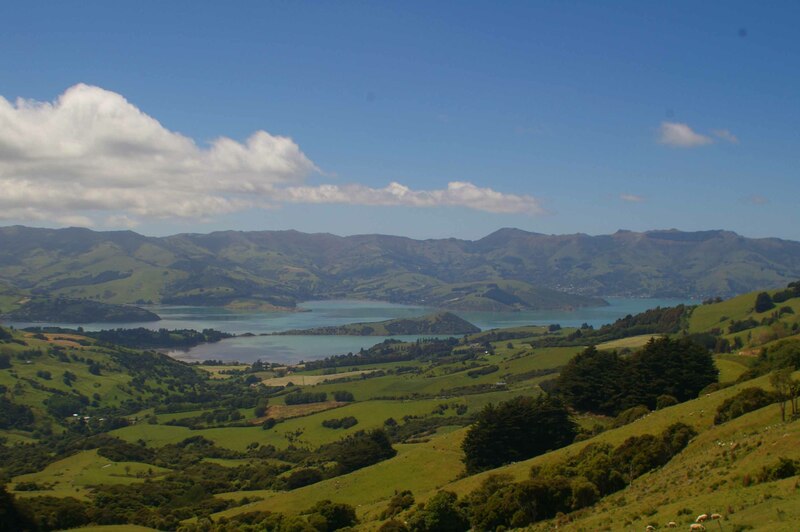 Akaroa was the place where 57 French colonists landed in 1840, unaware that the British had claimed the island a few days before. There are only a few French families left, but the town still trades on its French heritage, flies the tricolor, and gives French names to its streets and restaurants. I even heard French on the streets, but those were tourists— the locals all speak English. Today was our last day in New Zealand. Kathy flies home to New Mexico tomorrow, whereas I go on to the Coral Sea for a week of scuba adventure that will give “down under” a double meaning. Your trip looks fabulous so far. I hope to one day do something similar, especially the New Zealand part.